Titanium Motorsports Racing Journal #64: November 1st, 2011 - Motor has to come out to fix a stubborn oil leak. #64: November 1st, 2011 - Motor has to come out to fix a stubborn oil leak. As reported in the last journal entry, while testing at PBIR, the new motor developed an oil leak from the back of the motor so severe I had to put the car on the trailer. My guess was that the rear main seal that I installed (not the engine builder, Buddy) was leaking. Instead of pulling the motor, I could have removed the transmission, clutch and bellhousing and installed a new seal from under the car. However, not having a lift meant having to lay on my back and man-handle the heavy TKO transmission in and out of the car. Also, if it was not the seal that was leaking, (think oil pan) I would need to pull the motor anyway. It took just a couple of hours to pull the motor and once the clutch and flywheel were unbolted, I found not just the rear main leaking, but oil was coming out the rear of the drivers-side valve cover too, due to a loose bolt. 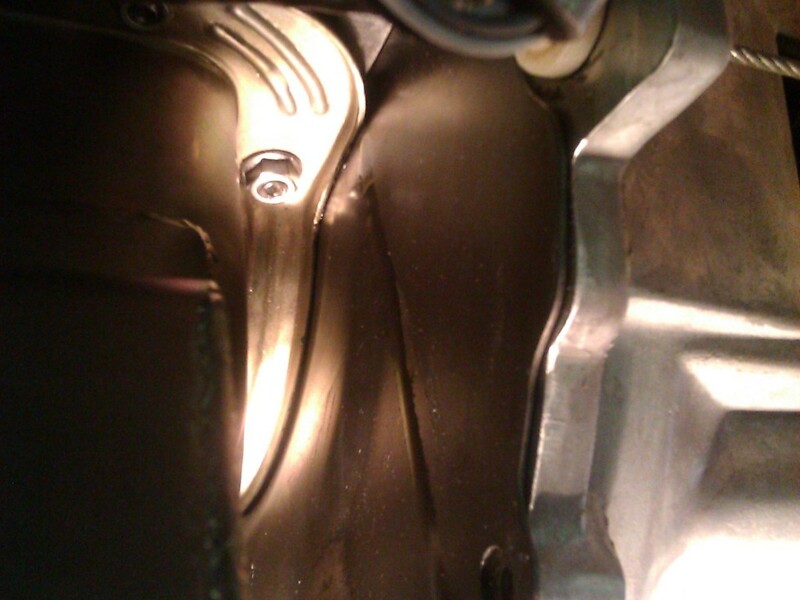 The rear main was leaking due to the inner lip of the seal getting folded-over during installation. So I decided to forgo using the installation tool and just used a hammer and block of wood to install a new one, just as most people do. With those two leaks fixed, I cleaned all the oil off the back of the motor and block plate, applied new sealer to the flywheel bolts and reinstalled the flywheel and pressure plate. With those task complete, the motor was reinstalled in the race car. After finishing hooking up all the rest of the accessories, installing the radiator and filling it with water, the moment of truth arrived. I fired up the motor, ran it for 15 minutes, then shut it down to check for any leaks. IT WAS STILL LEAKING FROM THE SAME AREA! So a couple of days later, I pulled the motor out again. This time I found that oil was coming out the threaded plugs on the back of the motor. The Boss block uses threaded plugs that seal with an O-ring, rather than a traditional cup or pipe plug. I did not have the correct size O-ring on hand to try a replacement, so I supplemented all the O-rings with a thin coating of RTV silicone and reinstalled the threaded plugs. With that complete, I reinstalled the motor, hooked up the accessories and filled the radiator. Once again, the moment of truth. I fired up the motor and ran it for 15 minutes, then shut it down to check for leaks. IT WAS STILL LEAKING AGAIN! By process of elimination, the only place left that will leak oil in that location is the oil pan gasket. So, the motor had to come out a third time, as the oil pan cannot be removed with the motor in the car. Replacing the oil pan gasket is much more time consuming than the other fixes attempted so far. There is a lot of cleaning and scraping of old gasket material and RTV that needs to take place in order to ensure the new gaskets does not leak. As with most engine builders, Buddy used RTV at the corners of the pan where it drops down around the seals at the front and rear of the motor. The leak happened right where the RTV stopped. I used additional RTV on the new gasket and extended it on to the oil pan rails as well. I reinstalled the motor and hooked up the accessories. Filled the radiator with water and fired it up. Last Modified: January 3rd, 2012.